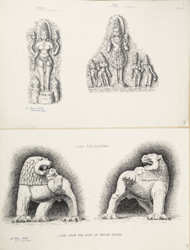 Illustration of Uma Devi and Surya from Lankesvara (top), Lions from the roof or mandapa of Kailasa (bottom) from Kailasanatha [Kailasa] Temple, cave XVI, at Ellora from James Burgess' 'Original Drawings [of] Elura Cave Temples Buddhist and Brahmanical.' The spectacular site of Ellora, in Maharashtra, is famous for its series of Buddhist, Hindu and Jain cave temples excavated into the rocky façade of a cliff of basalt. The works were done under the patronage of the Kalachuri, the Chalukya and the Rashtrakuta dynasties between the 6th and the 9th centuries. The Kailasanath is the most noted of all the splendours of Ellora, a free-standing temple rather than a cave, entirely sculpted out of a great mass of basalt. Commissioned by the Rashtrakuta king Krishna I in the mid-eighth century, it symbolises Mount Kailasa, the sacred abode of Shiva. A tall screen marks the entrance, and river goddesses mark the route to the three sections of the temple (a Nandi shrine, a mandapa, and the main sanctuary) which are on a raised plinth borne by elephants. The principal shrine is topped by a pyramidal tower (shikara). Superb sculptural friezes in the temple tell tales from the Ramayana and the Mahabharata, and of Shiva. Two monolithic obelisks are situated on the side of the main temple. They are 17 metres high and decorated with relief carvings.